The interview begins with the host–we don’t know his name given all the turnover at Fox News recently–asking Stapleton what he would do to improve school security. Stapleton responds with a call (see Tweet) for an “armed public safety official in all our schools.” That sounds fine, except when you realize there was an armed officer at yesterday’s shooting. Just like there was at nearly all of these shootings including Columbine. This is like “showing leadership” by calling for all automobiles to have brakes. ANCHOR: Would you go as far as Governor Scott did in Florida with his state legislature? ANCHOR: Well here hold on, I’ll help you–I’ll help you with what Governor Scott did, three-day waiting period for most purchases of long guns, raising the minimum age to buy those weapons to 21, banning possession of bump stocks, which uh can make semiautomatic weapons fire like an automatic weapon. Are you good with those? STAPLETON: I think, Nah, I think bump stocks is a federal issue with the ATF that actually was passed during the Obama years, so that’s not really a state issue. ANCHOR: So, a three day waiting period or raise the age to 21? Let’s break this down. You have the leading Republican candidate for governor of Colorado on national cable news to talk about school shootings, and he didn’t even do any research about what the Republican governor of Florida Rick Scott did in response to the previous major school shooting incident in that state. Once the obliging Fox News anchor recites all of the steps Florida took after the Parkland shooting, Stapleton declares that none of them are good ideas. Stapleton even dodges the question of bump stocks by blaming them on “the Obama years” without ever even saying clearly they should be banned. But by this time, it’s clear to everyone watching that Stapleton doesn’t know what he’s talking about–so who cares what he thinks? If you’re among the nearly-unanimous American public and even majority of Republican voters who agree that we can and must do more to prevent gun violence, this interview was a horrifying display of incompetence thinly concealed by outdated talking points. If you’re one of the diehard gun-rights supporters Stapleton was pandering to in this interview, you should be just as horrified that someone with so little knowledge about this issue wants to be the governor of a gun-rights battleground like Colorado. 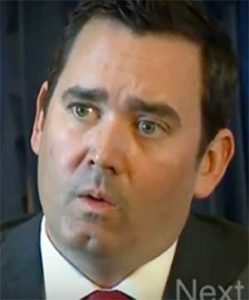 Either way, it’s quite a thing to witness again just how bad Walker Stapleton is at this. Dudley is happy with Walker's performance. So we have Dubya "Uh, I don't know" Staplegun as the best the GOP can come up with. Almost makes his cousin GW sound like an intellectual. "Strateegery" and "nucla" aside, he does make his cousin Dubya look smart. He knows nothing about gun safety. He didn't know about Rick Scott and Scott's gun safety measures – measures which have given Scott a bump in polls and a 4% lead over Bill Nelson. Someone needs to ask this guy the Sarah Palin gotcha question: what newspapers do you read? But none of this matters, I suppose. Remember, Walker Stapleton has a PERA plan, the coveted Tom Tancredo endorsement and he defeated the Taller Coffman. The Republicans would have been better off running Both Way Bob again. Perhaps third time would be the charm. According to Stapleton campaign literature I've received, I know that Walker is a conservative leader, family man, and a fiscal conservative. I guess his campaign staff thinks that the average Republican primary voter is a high school dropout, given the reliance on sound bites. His web site isn't much better. On energy and land, there is a paean to the oil & gas industry with a bare mention of renewables and no mention at all of the big & positive impact of outdoor recreation. His writers also don't seem to know much about how the state interacts with the federal land managers. For transportation, he & his staff promise to get after CDOT. On education, he supports more school choice, without mentioning vouchers. On sanctuary cities, he of course opposes (as do I), but doesn't seem to understand how the state interacts with home rule cities. When I get my ballot, I'll continue to look at Doug Robinson and Victor Mitchell. Sorry, Walker, you've blown your chances with me. At least you don't face the option of Taller Coffman. Such a nasty woman. Is Walker the dumbest Bush? Maybe in this part of the forest . . . I don't know. I think Neil still holds that title. Neil kind of retired the trophy. I dunno, Gray, but I do think this family needs to stop marrying back to their cousins. As demonstrated Saturday morning, even European royalty has finally worked that one out. Gee, I want to credit Dubya for saying what he's for. "a single point of entry, metal detectors, public safety officials who are armed at every school… "
Colorado Dept. of Education lists "1,888 schools: 1,091 elementary schools, 284 middle schools, 513 high schools." US Department of Justice says "The moderately-priced models around $4,000 to $5,000 probably offer the features and reliabilities [sic] required for a school metal detection program." Assuming few schools already have one and that we can get a bulk discount to only $4,000, that would be $7.2 million purchase price. "The initial purchase price of a portal metal detector is almost insignificant compared with the ongoing personnel costs to operate the equipment in a complete weapon detection program. An excellent example that illustrates this fact is the successful weapon detection program run by the New York City (NYC) Board of Education in about 50 of its inner-city high schools (exhibit 3.5). For just one of its schools with about 2,000 students, the weapon detection program requires 9 security officers for approximately 2 hours each morning. Two officers run the two initial portal metal detectors, two officers run the baggage x-ray machines, one officer runs the secondary portal metal detector for students who fail the initial detector, two officers (a male and a female) operate the hand scanners on students who fail the secondary metal detector, and two officers keep the students flowing smoothly and quickly through the system, such that nobody is able to bypass any part of the system. It should be noted that the only way these schools are able to avoid huge waiting lines, even with this much equipment and this many officers, and still get everybody to class on time is by a complete restructuring of their class periods. There is a significant staggering of first period start times so that the students arrive over a 90-minute period. " If we "only" have that sort of program for 500 high schools: 9 officers x 2 hours x $20/hour x 180 days in a school year x 500 schools … $32 million per year. I'm betting if we have the equipment and feel like it is worthwhile, there may be a demand to have similar protection for football and basketball games, maybe even some theater productions. So, perhaps someone can ask Dubya to explain where in the TABOR restricted budgets he thinks we can come up with $40 million or so dollars. Or ask for his cost estimate for that sort of protection. Football causes brain samage and should be eliminated from publicly funded schools. Brain damage? Perhaps, but that does lead to more ex-high school football players registering as Republicans when they turn 18. There goes Moderatus' $59 TABOR refund check next year. They will do anything, spend any amount, to avoid relatively cheap legal fixes like requiring that guns be licensed and insured like cars, universal background checks, and "red flag" gun removals. Safety locks required in the home should be part of rental/home insurance programs, as well. Right now, they are not. Because RMGO / NAGR and the NRA and the like are very good at lobbying, and politicians like all of Colorado's GOP delegation gabble out of both sides of their mouths. Does that also include one point of exit? In addition to being reminded of the Triangle or Coconut Grove fires (yikes! ), that calls to mind the cinema massacre where the creep wedged open an exit door in order to reenter the cinema without having to pass through the lobby with his arsenal. Plus, it would make schools more prison-like and more of a warehouse environment than they are now. It was something that struck me way back when I was doing my methods of teaching classes – the inner city low income schools were in older buildings, constructed with maze-like hallways, poorly thought out additions, and low fluorescent lighting. The building definitely had a stark, warehouse-like feel. Kids wore uniforms and had a strict dress code. Resources were scarce and teachers competed fiercely for them. The message was that schools are a business with a product of robotlike graduates. Th richer suburban schools, on the other hand, had 3 story atriums with natural lighting, dedicated, staffed subject computer labs, flexible learning spaces, and the students could express themselves with hats and individual clothing. The message was that schools were there to graduate creative individuals with unlimited potential. As a practical matter, all schools since about 10 school shootings ago restrict access during the school day. Only users with key cards can get in, or the secretary has to buzz you in. It’s why the Santa Fe, TX killer arrived at 7:30 in the morning – it’s the only time there’s unrestricted access through the front door. Wealthier schools and fire marshals would never accept what Walker, from his copycat brain, is proposing. Maybe the NRA and gun manufacturers should come up with the money and sponsor school security programs. I think we know what the NRA and gun manufacturer's solution to school safety would be – more guns. Duh. I'm not saying they structure the school safety, I'm saying they fund it. Who would you propose structuring school security? Police? How bout homeland security? Seriously there was crazy money allocated to the military in that last budget, why not funnel some of that money into school security? Why do you think these things are always happening at schools too? I mean where is the football game mass shooting or the nascar slaying? Diverting money from the military budget to school safety? Glad you finally see what you people have done to schools. Turned them into a battlefield in a war zone. Now shut your pie hole and go stroke your weapon. Hilarious, Negev….the NRA and gun manufacturers would actually fund what students really want. Nuh-uh. That will come without the gun industry's cooperation, from their "cold dead hands", you might say. Football games actually have security pass-throughs – mostly to protect the profits of the concession stands. Wouldn't want people to drink a bottle of water costing less than $5. And the teams better the hell fund their own security – we're already subsidizing all the football stadiums. I don't know about NASCAR events. But the Las Vegas murderer picked off people at a country & western concert. And….be careful what you wish for. The concert slayings, the movie theater slayings, the night club slayings, the shopping mall slayings, the church slayings, the home depot slayings, the Wal Mart slayings — where oh where, indeed? I miss the old days when we just needed to worry about a postal worker with a grudge. * where the students' spend their time — mixing with their "enemies," their "girlfriends" who have spurned them, their teachers who embarrassed them, and the other kids they want to show off to. * there are stories of other people who shot up schools — plenty of newspaper and newspaper stories, movies and books about Columbine, even video games focusing schools. And I think they should come up with the money for the funerals they abet . . .
. . . they could also help replace the lost wages to families of the mothers and fathers that have been gunned down.
. . . And, I really believe they should pay for on-site memorials everytime there’s a shooting. Your freedom has a cost, and we should all remember the blood price paid to secure and maintain that. But, yeah, there’s lots of costs that they are responsible for and should be paying, I like that you’re finally beginning to see that and maybe even showing some personal responsibility. The NRA uses school shootings to sell more guns, why would they do anything to stop them? Building Fortress America will be great for the Republican construction corporations. Personal freedom not so much. The private prison industry is probably working up proposals as we speak on converting their excess capacity into schools, and bidding on new school construction using existing prison designs. The Oracle of Wisdom from which Negev gets all his great ideas! I take it then that you prefer personal freedom over security? I agree with you on that. It is only a binary choice to right-wing morons. Only when it comes to your definition of second amendment (rights) entitlement.